Why are your feet apart? You’re only halfway. Bend your knees more! I received these corrections (and more) from Chris Saudek during her recent workshop in Victoria. I wasn’t surprised. I’d met this master Iyengar yoga teacher at three prior workshops, and I expected sharp feedback. She doesn’t miss a thing, and she doesn’t hold back. She points out errors; she insists on effort. Like most Iyengar yoga teachers, Chris is sparing with praise. If she walks by me in silence, it’s a positive sign. I had to laugh at those reactions. What do people want from yoga teachers anyway? exercising or involving careful judgment or judicious evaluation. To me, the best teachers are very critical—and also quick about it. First, they readily spot students’ strengths and weaknesses and instinctively know how guide them toward improvement. Second, the best teachers convey what they see, especially if they see errors and confusion. Giving “positive” feedback is simple and stress-free. Giving “negative” feedback is more complicated. A correction must be accurate (obviously) and immediate (for effective learning). It must also be appropriate for the student’s maturity and condition—for it would be unreasonable to overcorrect beginners or those with injuries or illnesses. Being critical is demanding. Critical teachers cannot be on autopilot, but must process myriad thoughts while teaching. And they must clearly articulate their feedback, sometimes repeatedly, to get the message across. It’s much easier to be a minimalist teacher, who sticks to giving general instructions and correcting only egregious errors. Of course, criticism shouldn’t be excessive and cruel. Teachers must have a sense of proportionality. A screaming tirade for an asana lapse is ridiculous. There is no justification for abusive behavior. As mentioned, Chris is liberal with corrections. I find her in-your-face approach very effective. Knowing that I’m being watched heightens my alertness (and, with Chris, I’m on high alert). I work harder, I pay stricter attention, I perform poses more precisely, I hold them longer and push my limits. Praise can be nice to hear, but does it really enhance learning? I once took a random power yoga class, in which I heard words like “beautiful!” and “fantastic!” Everyone got compliments. Ostensibly such feedback is helpful and encouraging. In “How Not to Talk to Your Kids,” a New York Magazine article, Po Bronson discusses the breakthrough studies by Carol Dweck, Stanford professor and author of Mindset: The New Psychology of Success. She found that kids who are praised for their innate abilities (rather than for their efforts) become preoccupied with looking smart and with avoiding mistakes. They see struggle as a stigma. They have no way to deal with failure if their natural gifts prove insufficient. In contrast, kids praised for their efforts believe that they can improve themselves through commitment and hard work. They are undaunted by challenges—and they are resilient during setbacks. Dweck’s findings contradicted the prevailing notion that all praise boosts self-esteem. If a yoga teacher frequently praises a student’s textbook form, the student might end up overvaluing physical perfection. Other students, less experienced or less adept, might undervalue their own efforts. When even experienced practitioners are corrected, however, they are motivated to keep improving, while novices see that mastery is elusive. To avoid being overly influenced by criticism or praise, we must be self aware and grounded. If we know what we can and cannot do, why would we be floored by other people’s opinions? If we have a solid yoga practice, we won’t be dejected by strong words. 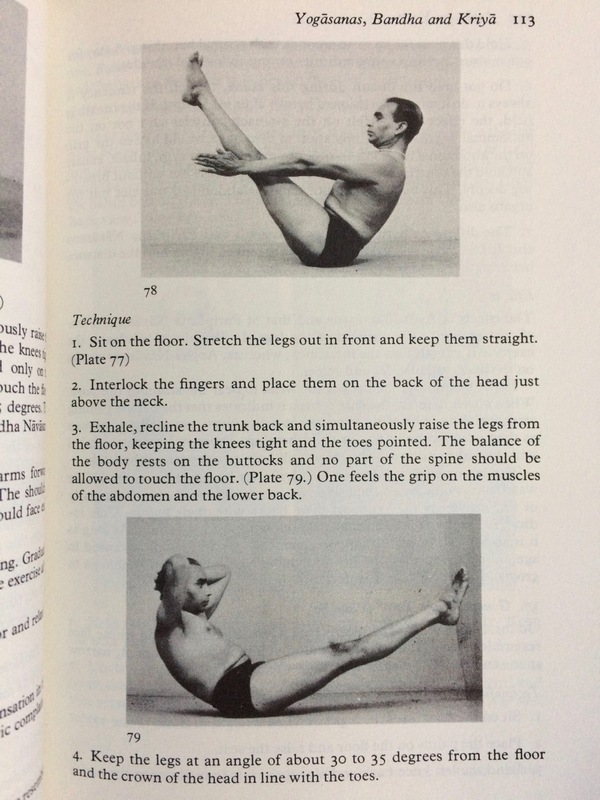 I received Chris’s “lift your chest” admonition during a second or third Paripurna Navasana (illustrated above, plate 78) which we entered with straight legs from Dandasana and held for an eternity! I’ve always found this pose doable (unlike Ardha Navasana (plate 79), which is torture) and momentarily thought to myself, “Don’t I get credit for my 60-degree angles?” But, solid pose or not, she’s right. I can do better, I can do more. I’m generally a bit thin skinned. My first reaction to criticism is to defend myself. But I’ve developed a thick skin in two major realms of my life: writing and yoga. I am unfazed by a critical reader who blankets one of my drafts with red marks. Likewise I accept—and welcome—yoga corrections from a critical teacher. Wonderful article, Luci! I agree – corrections by senior teachers are key to my evolution and give me confidence to push beyond my self-imposed limitations. This attention to correct action is what keeps us safe from injury – better a sore ego than a bulged disc! I really enjoyed this article! Having been at Chris’ workshop as well, I appreciate your perspective on the value of honest criticism. I find the directness of senior Iyengar teachers to be beneficial as well. However, I have had some classes where the teacher seemed to overdo it in terms of being like Mr. Iyengar. Where Mr. Iyengar could be direct and seem harsh, you could feel that it came from love and an urge to push the students to do better by cutting through the psychology that might be holding them back. But teachers who have spent much time in Pune and maybe have been on the receiving end of those corrections, but have not developed the sense of love and cultivated a healthy ego, end up sounding personal and belittling rather than critical and supporting. I don’t mean to say that this is in any way common, but underscores the difficulty in presenting criticism effectively, not only because a teacher needs to tailor it to the level and capacity of the student, but also needs to be conscious of where it is coming from inside of them. Thanks for commenting, Melissa, Glenda, and George. You make a good point, George, about the teacher’s motivation. Yes, in additional to being warranted and proportional, criticism must come from the right place. Teachers must act based on their students’ needs, not their own. It’s also risky for teachers to copy their own teachers’ style. Again, where is the motivation coming from? Great article on ‘criticism’ and perspective. I can so relate to being thin skinned around yoga and enjoyed how you brought focus onto criticism as refinement in order to go deeper, reaching for a higher potential. I also think that this needs to be in a context of a solid base, a stable sense of self, or the opposite effect can also happen where people lose heart when they are not able. I find that attending to both is essential from a teaching perspective. We are fundamentally okay in our innate capacity and we can reach for more as long as this is done from a place of curiosity and exploration rather than needing to be more. I believe that beginning practitioners benefit from praise and encouragement, but experienced practitioners benefit from correction more. Praise is like candy and correction is like eating your vegetables. I was also at this workshop. It was my first experience of Chris’s teaching. I relate to being hyper-alert too because she doesn’t miss anything! I believe criticism is the most helpful when it is direct and specific (Chris’s was) and is appropriate at any level. I danced for many years and experienced both constructive criticism and disparaging remarks. The teachers I learned the most from knew how to deliver corrections in a very focused, specific way that would help me improve. That being said, it’s a fine line, an overly critical teacher can inhibit students too. There has to be some restraint.